I’m a big fan of DOIs. These are links to papers, or any digital output that should be permanent. 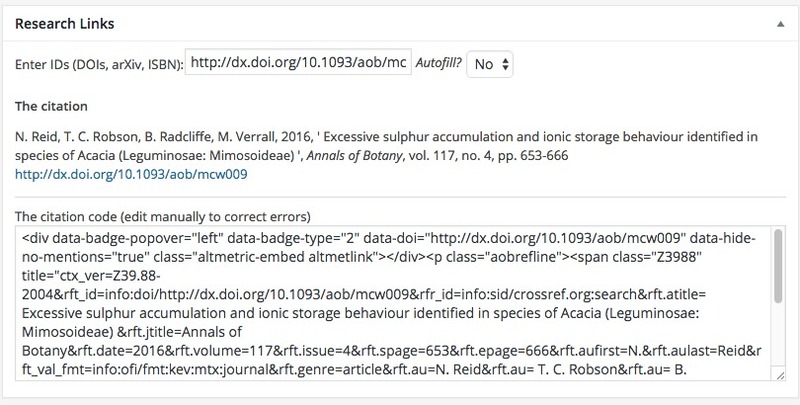 For example OUP has changed the system for hosting Annals of Botany and AoB PLANTS papers recently. The URLs have all changed, but because we link to DOIs here, there’s no urgent need to change all the links. However despite living online, DOIs aren’t always clickable. quite often you’ll see something simply listed doi: 10.1136/bmj.f7198 without a clickable link. You can highlight, copy type https://doi.org/ and then paste the DOI on the end, but is there a faster way? There is with this bookmarklet. Now you just highlight the part after doi: for example doi: 10.1177/1052562913502639 and click the DOI bookmarklet to see the paper. To add it to your own browser you’ll need to be able to edit bookmarks. First highlight the code below and copy it. Next, drag the URL of this page to your bookmarks bar. Now right-click on it to edit. Where the field is name delete the contents and replace it with DOI. This is so you know which button does the job on your toolbar. Now go to the URL or Location field. This will have the address of this page in it. Delete it and paste (cmd+V on a Mac, ctrl+V on Windows or a Chromebook) the code into the URL field. Now any time you see something like doi: 10.1016/j.addbeh.2012.12.002 highlight and click and the link will open in a new window. DOIs from AJCann’s LOL file. He has many more.